The custom wall mural image we are featuring today is a detail of a piece of ancient Chinese artwork. The original piece is a watercolor work on rice paper. This mural embodies one of our key phrases here at Great Wall Custom Coverings: "changing the way we live with art." Taking a piece of artwork and transforming it into a custom wallpaper installation takes what would be merely an element of a decor scheme and creates an undeniable focal point. As opposed to a smaller piece of art, a wall mural demands attention in a way that typical wall art simply can never attain. The artwork becomes a presence that is not only enjoyed, but lived with in a highly salient nature. And gentleman, I'm not sure if you'd typically decorate with a floral, but this is one highly masculine botanical. 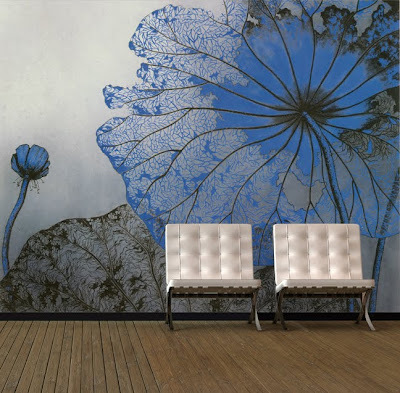 The blues and grays keep this floral based mural much more neutral than typical flowery prints, while still retaining the softness you'd expect from natural imagery. ArtisticHomeowner.com was created by experienced internet business owners, graphic artists, and creative, home artisans. For 5+ years, we have provided our clientele with quality printed wallpaper murals and custom murals as per their satisfaction. this is the only way to make the wall of your home decorative and it is the best way. I would like to purchase a high Res Image of this mural. Need to get the image printed on fabric.